I love a good loaf of bread, so when I found a recipe for Caramelized Onion Bread, I just knew I needed make it! This bread is fantastic! I adjusted the recipe to make it with some whole wheat flour and it was still delicious. I served this bread alongside some tomato soup and it was a heavenly pairing! Caramelized Onion Bread also makes a fantastic grilled cheese sandwich as well! This bread is so tasty, I might even stop buy store bread! So good! In a medium pan, cook onions and tablespoon of canola oil over medium-high heat until onions are translucent. Reduce heat to medium, add remaining canola oil and continue to cook the onions are golden, about 15 minutes. Cool to room temperature. In a large bowl, combine yeast, honey and ¼ cup of water. Stir to dissolve yeast. Let stand until yeast is foamy, about 5 minutes. Pour in the remaining water, the whole wheat flour, and 1 cup all purpose flour and mix well. Add the onions, black pepper, salt, and remaining cup of all purpose flour and mix. Turn out dough onto a lightly floured surface and knead until smooth and elastic, about 10 minutes. Place dough in a lightly oiled bowl cover with a towel and allow to rise in a warm, draft free area until doubled in size, about 1 hour. Preheat oven to 350 degrees. Lightly oil a loaf pan. Gently punch down the dough on a lightly floured surface. Using a rolling pin, roll the dough into a rectangle. 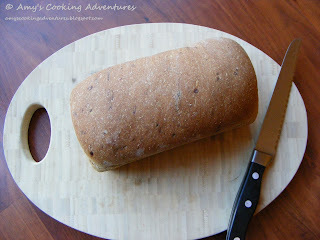 Roll the rectangle into a log, tuck the ends in and place in the loaf pan. Cover and let rise until doubled, about 45 minutes. Once the bread is doubled, move it to the oven and bake for 45 minutes. The bread will be a dark golden brown and will sound hollow when you knock on the top. Alternately, turn dough out of the pan and gently stick a sharp knife through the bottom of the loaf until it hits the top. Put of the knife and check for any raw dough. Turn loaf out onto a cooling rack. Let the loaf cool to room temperature before slicing. 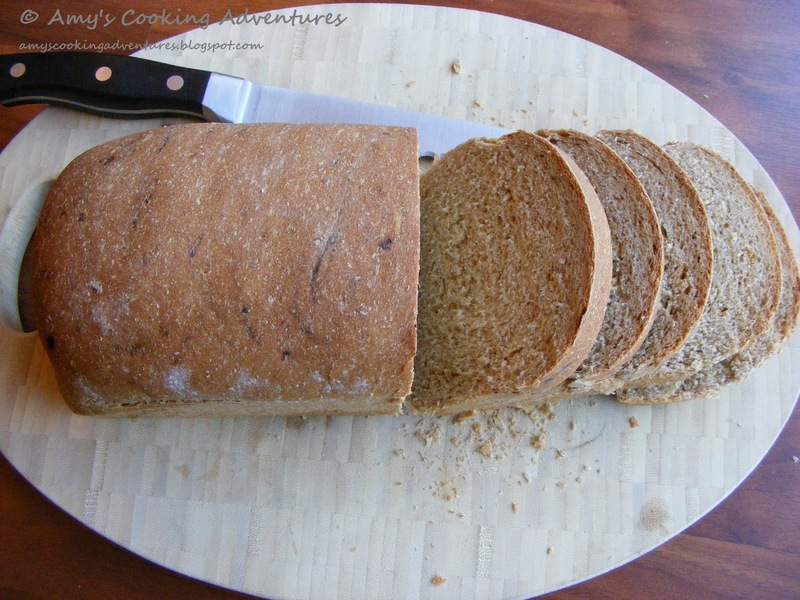 I love homemade bread and this sounds so delicious with the tomato soup! Oooo! I'll bet your kitchen smelled wonderful while baking this!!! Beautiful looking bread! You're right, the house smelled great! We just couldn't get enough! I like it. I never tried such a bread.